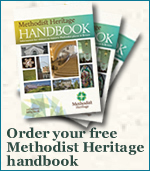 All material contained on the Methodist Heritage website is covered by UK and International Copyright laws. Images (apart from Methodist Church logos) on this website must not be used without prior permission. Contact the web editor webeditor@methodistchurch.org.uk with requests. Every effort is made to ensure the accuracy of information on this website. However The Methodist Church of Great Britain cannot be held liable for any loss or damages resulting from any inaccuracies or misinformation that may inadvertently be published here. Every effort is made to ensure that this website contains no viruses. However The Methodist Church of Great Britain cannot be held liable for any loss or damage to computer hardware or software caused by the use of this website. The Methodist Church of Great Britain is not responsible for the content of external websites.